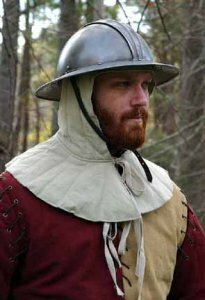 Featured in the movie on a variety of knights and men-at-arms, it's the perfect addition to any reenactor or medievalists garb. Heavy pale green cotton fabric with double tie front. This hood can be worn with many different helmets. Hand wash, hang dry. Choose S/M or L/XL.